Oh my, happy curry tummy happened the other night, yum. This easy to make vegetarian casserole is jam packed with vegetables, brown rice, lentils and seasoned mild or wild with curry powder and a healthy dose of ginger. The top crust is a walloping layer of beta carotene in the form of mashed squash and sweet potatoes. You can make this spicy or mild, vegan or gluten free depending on your preferences and needs. My family loved it, although I think it was a tad too spicy for our littlest boy and that was my mistake. 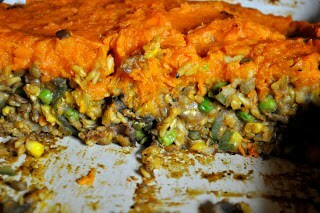 I combined the recipe for this Indian Inspired Shepherd’s Pie that I made last winter with the recipe for the Vegan Meat Substitute and the results were amazing. I was going to share this for my Just Another Meatless Monday post but due to the rainy cold weather here and in many other parts of the United States I though we could all use a good dose of happy curry tummy now, rather than later. Make the necessary adjustments to the given recipes to make it vegan or gluten free, basically you’ll not be dotting it with butter OR adding flour to the meat substitute recipe. And of course please adjust this to what you have or like and make it yours. Enjoy! Mmm. This looks tasty! Did you mean 16 oz of squash? 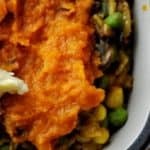 I never thought of making sheppard's pie with sweet potatoes. Great low-carb alternative. And I love Indian spices! Thanks so much for sharing this!